GAB Speaks at Mequon Rotary Club. 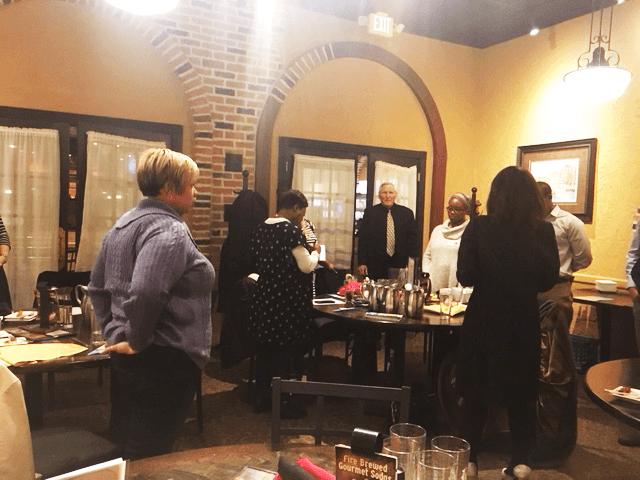 What a great discussion about bullying before the Greater Milwaukee Mequon Rotary Club at the Sprecher Restaurant at Bayshore Town Center, Glendale, WI. GAB Executive Assistant, James Dean was invited before the group to discuss bullying and what role does GAB’s Peer Ambassador Program have in schools. James explained that GAB’s Peer Ambassador Program changes how schools address bullying because it puts the power to stop bullying into the hands of the students where the bullying is actually occurring. “The Peer Ambassador Program is all about creating upstanders within the student population, said James.” A very good discussion revolved around the recent municipal ordinances that fine parents if their child is caught bullying. The rotary is interested in helping GAB establish a Peer Ambassador Group in their local schools. Special thank you to Ponyville and their donation, which makes it possible for GAB to expand out program awareness by providing a speaker to local groups and schools and create more Peer Ambassador Programs.